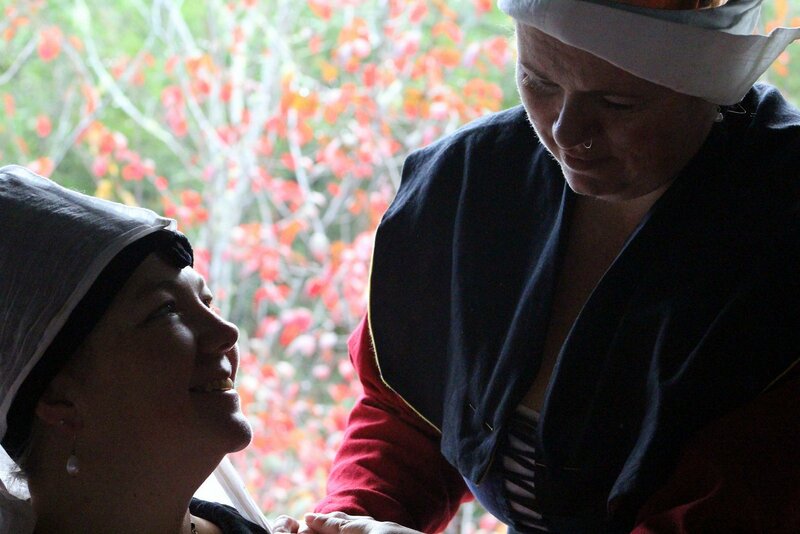 The Perfectly Period Feast is an event that happens in the West about every two years. The two years leading up to the feast are filled with classes, projects and research to enhance the “perfectly period-ness” of the Feast. November 2017 will be the PPF-Burgundy. 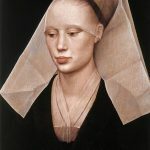 The feast day is centered in 1450 to 1468 in a pretentious, wealthy merchant household. This will be the first PPF in which I’ve participated. – (done) Prick stitch the seams on the bodice outer fabric open. – (done) Sew the outer collar together. – (done) Prick stitch the seam on the outer collar open. – (done) Sew the inner collar together. – (done) Prick stitch the seam on the inner collar open. – (done) Cut out interlining for collar. – (done) Sew collar to bodice outer fabric. 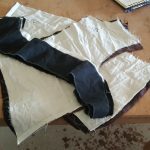 – (done) Fold the collar the wrong way (into the neckline) and then run a prick stitch around in the brown to catch the seam allowance of the collar to force it to lay right. – (done) Figure out pattern for sleeves and cuffs. – (done) Sew sleeve outer layer and cuff together. Prick stitch the seam open. – (done) Set sleeve outer layer and cuff into tube and prick stitch the seam open. – (done) Sew sleeve lining and black velvet cuff together and prick stitch seam open. 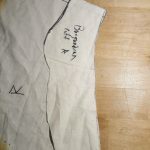 – (done) Turn seam allowances inwards and sew together at the end of the cuff. 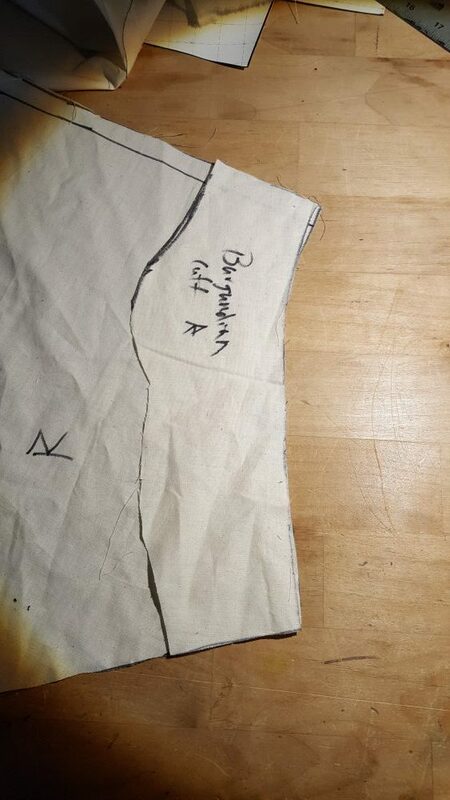 – (done) Baste seam lining and outer fabric together at the armseye. – (done) Sew sleeves to bodice outer fabric. – (done) Attach skirt to bodice outer fabric. – (done) Sew bodice lining into the outer bodice fabric so that it covers the sleeve and skirt seams. Bodice fabric all cut out. Prick stitch hold down the seam allowance on the outer fabric of the bodice. Fold back cuff laid over end of sleeve. Cutting out the reinforcement for the center of the belt. Well, I’ve been thinking about this for the last year.. but hey, it’s finally 4 weeks away so let’s actually get to work. When I made the brown gown for my Laureling ceremony I lined the skirt and sleeves in black velvet. This was lovely.. but it turns out made the garment “stick” whenever you try to put it on or take it off It also weighs a ton. That and the dress was sized to fit me 50 lbs ago. I’ve worn it one time after my Laureling ceremony.. and have decided that I don’t want to sell it.. and that I’m ok with cannibalizing it for another outfit. Initially I thought I could just alter the neckline to make it into a V, but as mentioned, the gown fit 50 lbs ago.. and if I widened the neckline into a V I found that the weight of the sleeves dragged the gown off of my shoulders. I struggled with this for a while and could not come up with an easy fix, so instead, since I have plenty of the brown velvet fabric, I’m making a new bodice and then will salvage the skirt off of the brown gown and will be lining it in black linen and salvage the black velvet for a future project. 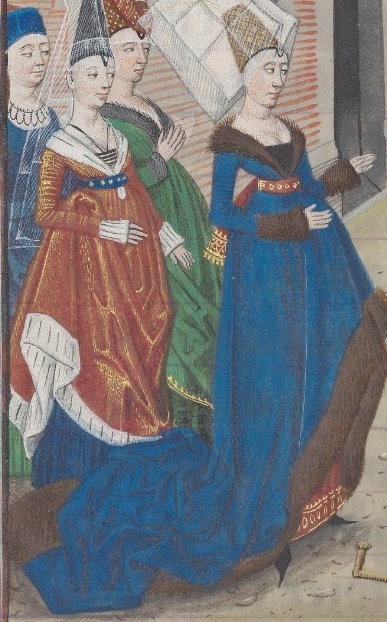 Because of this, my Burgundian gown will have a waist seam. I’m not entirely certain that’s appropriate to this time period.. but it’s what I’m going to do with the materials I have. I used the body block that I made back in on Master Charles de Bourbon’s class in March for the pattern for the v-necked overdress. 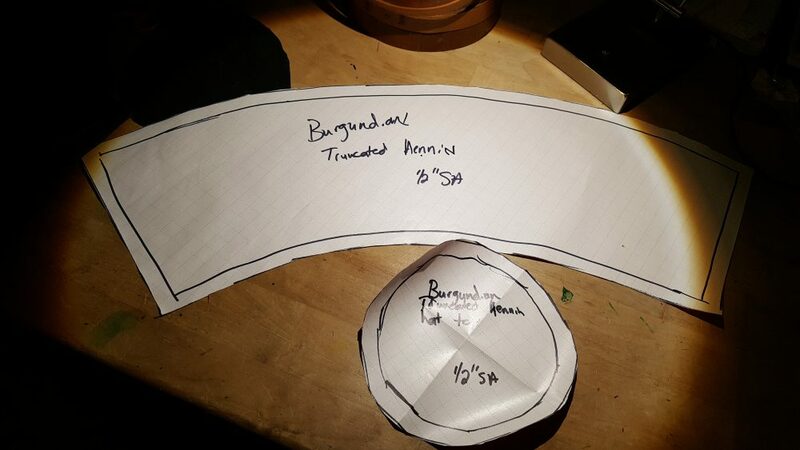 I also did the mental gymnastics to figure out how I’m going to attach the collar (a piece I’ve never done before). I think I’ve got it. I’m still deciding whether I’m going to sew the front closed or add hook-and-eye. Sewn closed is certainly easier (and faster). I think I’ll go with that initially. I can always go back and re-do if needed. Tonight I cut out all the bodice and collar fabric. I’m planning to cannibalize the skirt from my brown gown. 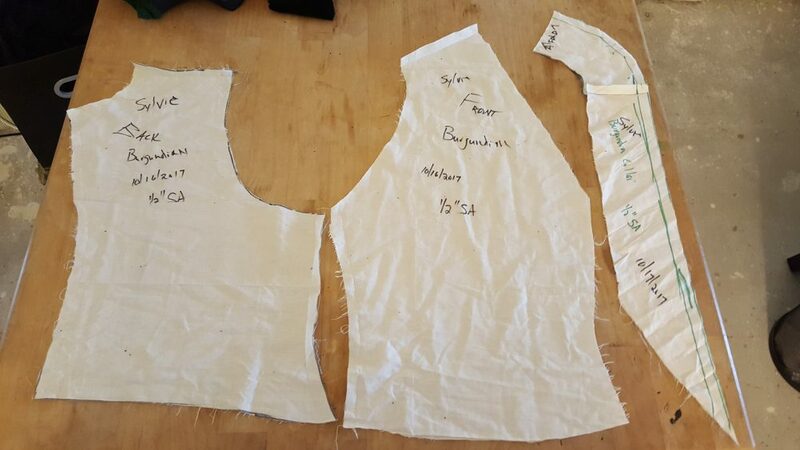 Once I have the bodice together I’ll be able to double check my sleeve pattern to get that cut out and going. 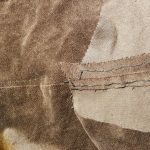 I machine stitched the brown velvet bodice front, back, side and shoulder seams. 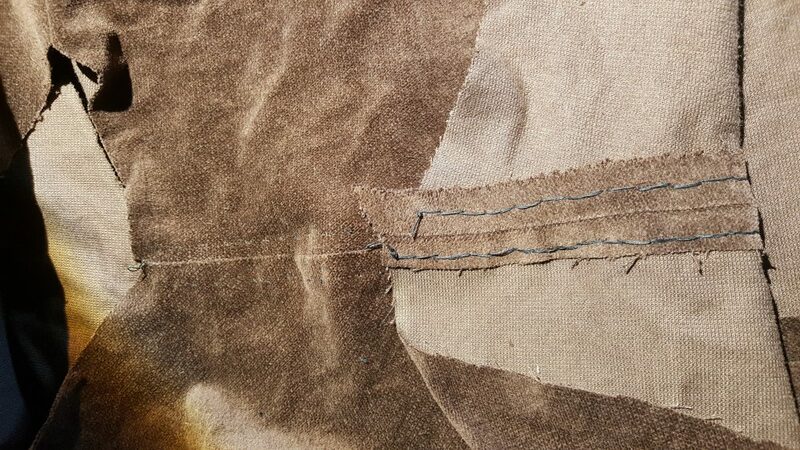 Then I started prick stitching the seams open (picture added to the progress gallery showing the front and the back). This is my first time doing the prick stitch.. and it’s also my first time using my tailor’s thimble. I didn’t get a blister.. but I can definitely see how practice will make this more comfortable. 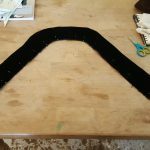 When I cut the collar out of the black velvet I decided to cut it with a seam at the center back (less wasteful of fabric). I stitched this together on each half of the collar and then prick stitched the seam open. The black velvet has less body than the brown velvet. 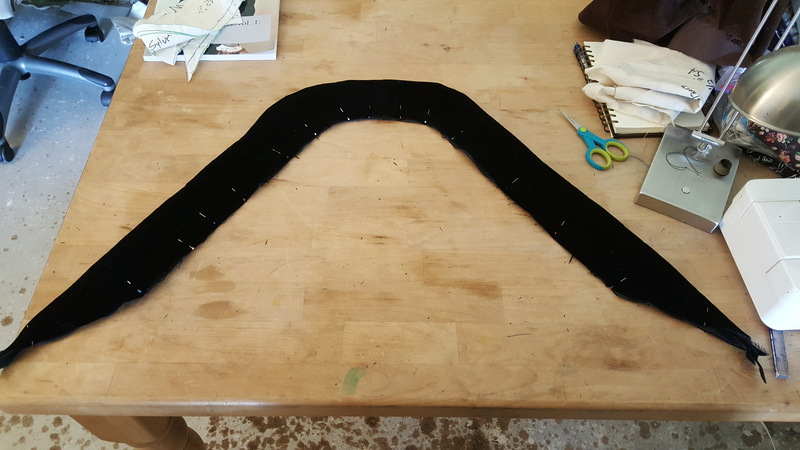 After mulling this over for a bit I’m worried that using only black velvet for the collar will not be enough to keep the collar from curling. So I’ve decided to add a bit of interlining. I’m using black cotton trigger which I had in my stash. My stash currently doesn’t have any linen or hemp canvas available which would probably be more appropriate but I think the trigger will be good enough. I was able to cut the collar interlining out as one piece. I then stacked this up interlining, black velvet collar with right side up, black velvet collar with right side down. 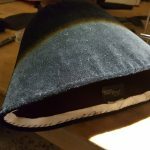 I machine stitched along the outside edge, clipped my curve and flipped this so that the velvet was on the outside of both sides. I finger pressed this and finally pinned the collar edges to keep the velvet and interlining all lined up. I have a feeling I should hit this with an iron but I’m scared it will damage the pile of the velvet so I’m going to hold off on that and see if finger pressing is enough. I finished the prick stitching on the body of the bodice. I also finished the bottom point of the collar and attached the collar to the neckline of the bodice with machine stitching. 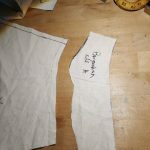 In order to lay right the seam allowance at the neck for the bodice and the collar will need to fold back under the collar. In order to ensure this stays flat I’m planning to run a line of prick stitches under the collar to affix the seam allowance. Hopefully this will keep that edge flat and help the collar to lay right. I’m super anxious about the collar. Frankly I don’t think I’ve ever done a collar like this before. I prick stitched the collar seam allowance down inside the neckline of the bodice. Easy peasy. Now just cross my fingers and hope that it works. Next up, sleeves. Early in the evening I did a fitting for Helga for her German coat. 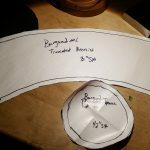 Later in the evening, while working on my Burgundian I pulled out an old sleeve pattern as a place-to-start for the Burgundian’s sleeve. The old sleeve head EXACTLY fits the armseye for the Burgundian and the length is exactly right. Boo-ya. Fiddled for a bit to come up with a decent fold-back cuff pattern. I’m pretty pleased with the results. I feel like I know what I’m doing (queue the ominous background music). Cut out the sleeves, cuffs and lining. Stitched cuff to sleeve lining and outer fabrics. Prick stitch all the seams open. 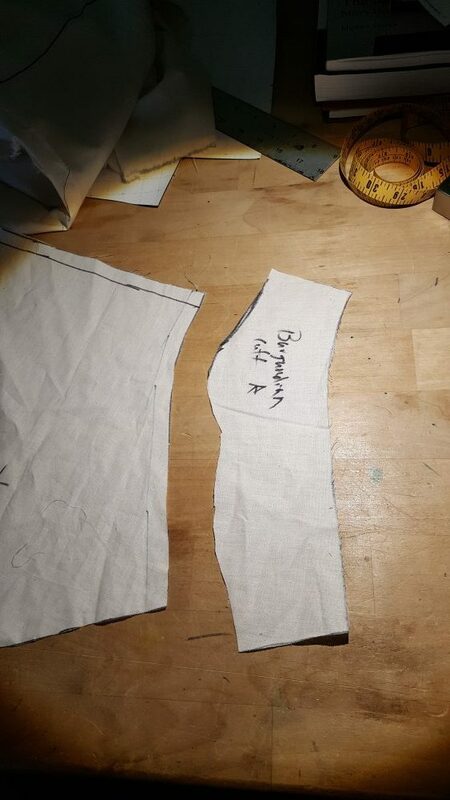 Stitched sleeves together along the length of the outer fabric. Prick stitched all the seams open. 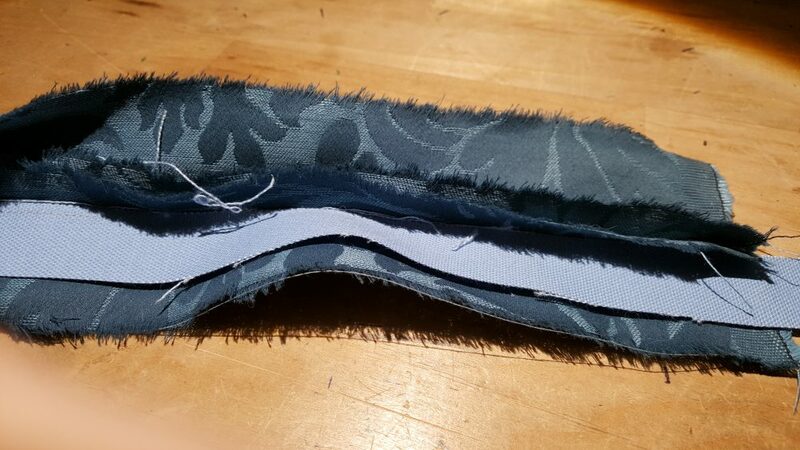 Attached lining to outer fabric at the seam allowance. So okay… The Modern Maker says to do this.. and has a couple of pictures.. but I’m still kind of in the dark about how this is supposed to work. 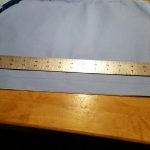 I ran a big basting stitch in the seam allowance on once side of the lining attaching that to the seam allowance of the outside of the sleeve and then creased the other side and slip stitched the lining closed. I have a feeling this is not what he was trying to get me to do.. but it’s done.. and fret about it on another garment. 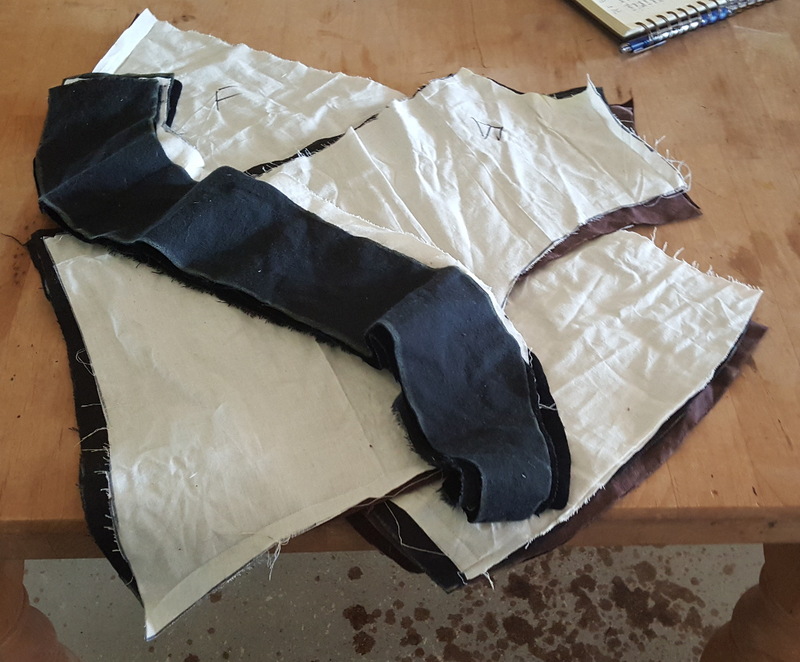 Turned the cuff end seam allowance inwards and slip stitched them all together. 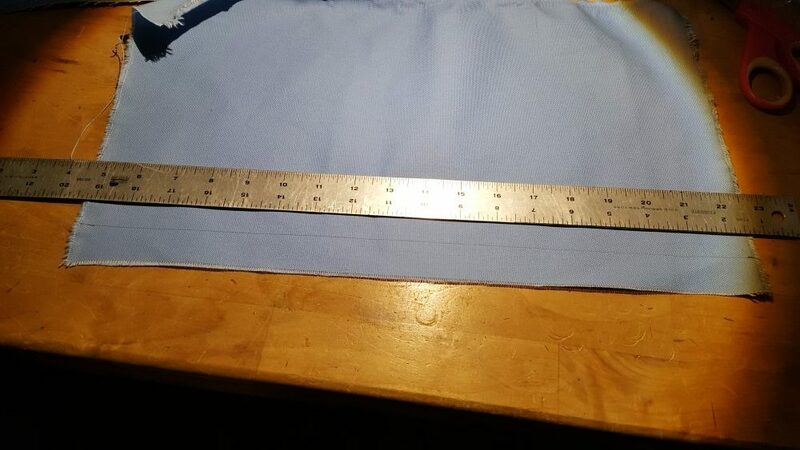 Ran a quick baste stitch around the armseye of the sleeve in the seam allowance attaching the lining to the outer fabric. I removed the skirt from the brown gown and took out all the back pleats and stuffing. I determined I can remove 2 panels from the skirt and still have sufficient skirting to add some pleats across the center back. After careful consideration (of the short amount of time remaining) I’ve decided not to remove the black velvet lining. It’s still a bit heavier than I’d like but given the fact that I now want to wear this in a week and I don’t have sufficient black linen to do the lining and the fact that the black velvet binding on the edge of the skirt is yummy and lovely I’ve decided the wiser course will be to use the skirt lined in black velvet. I removed the center back two panels and then connected the two halves to make one skirt. 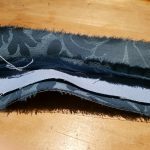 I’ll need to hand finish the last of the connecting seam and repair the black velvet binding at the center back. Finished closing up the skirt and repaired the black velvet binding at the center back hemline. I machine stitched the skirt to the bodice, then I prick stitched the seam into the bodice. Finally I attached the sleeves to the bodice. All that is left is to prick stitch the sleeve seams open and stitch the lining into the bodice. Prick stitched the sleeve seams into the bodice. 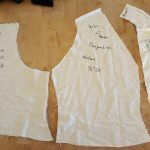 Re-reading “The Modern Maker” I’ve made different construction choices from the garment he describes so I’m kind of winging it with putting the lining into the bodice. In retrospect I can see how attaching the lining would be easier to do before the sleeves were added. That said, I attached the back lining and have the front lining pinned in place. The dress is nearly done. I should finish tonight. So my mind moves on to the next piece, the hat. Much to Fearghus’ amusement I was in Jo-Anne’s and Michael’s on Saturday trying baskets on my head but sadly, no luck. I was not able to find a decent basket to use as a base. Finally I bought a sheet of posterboard and planned to fake up a truncated cone tonight. 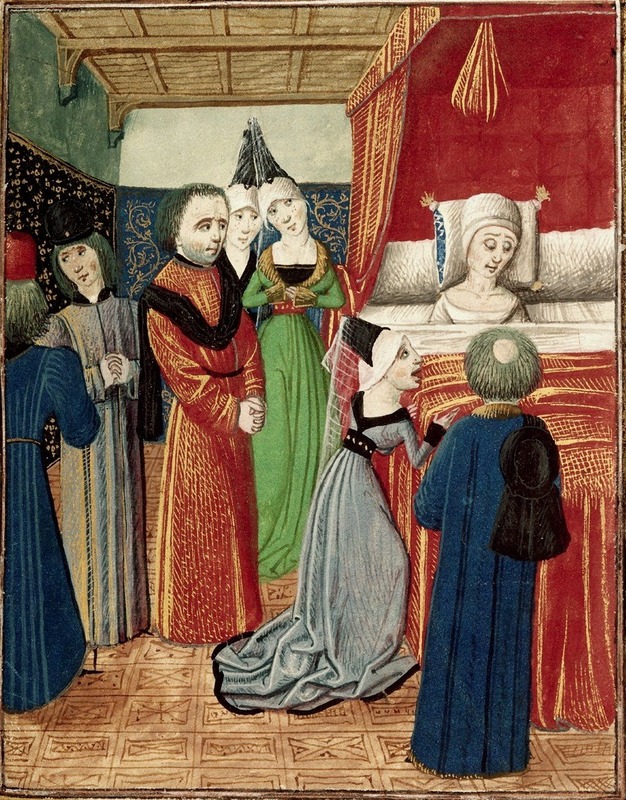 Today I’m sitting here mulling over how uninspired I am to mock up a cone and it hits me.. this truncated henin is like a fez (Fez are cool). It’s too bad I don’t have a fez. Then I had a facepalm moment. Halloween just happened.. I was recently IN a Halloween store.. and saw a stack of fez AND DIDN’T BUY ONE. UGH! Luckily Amazon also has fez.. and even has same day delivery. Ca-ching! Fez acquired. Hat is back on schedule. 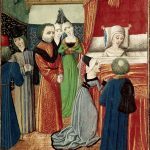 We had folks over for Medieval Fight Club. Everyone left at about 10 and I was done sewing the last of the lining into the dress by 11:30. Done is beautiful. Next up, the hat. Just as I was getting into bed last night I finally figured out how to draft the truncated cone. I love brilliant flashes of insight just as I’m laying down to sleep. If I hadn’t already bought a fez this would have helped me immensely. I was struck by a mad bug and instead of working on my truncated hennin I sewed a belt together. My husband got the fittings for me from Raymond’s Quiet Press when he was at Estrella in February. While shifting through my sewing drawer I came across the fittings and realized I should make a belt to use those fittings to go with this outfit. I cut two strips of fabric off of a roll of blue damask I’ve had for the last 10 years. In the middle I sandwiched a layer of canvas. I then slip stitched the outer edge and sewed this to the fittings. 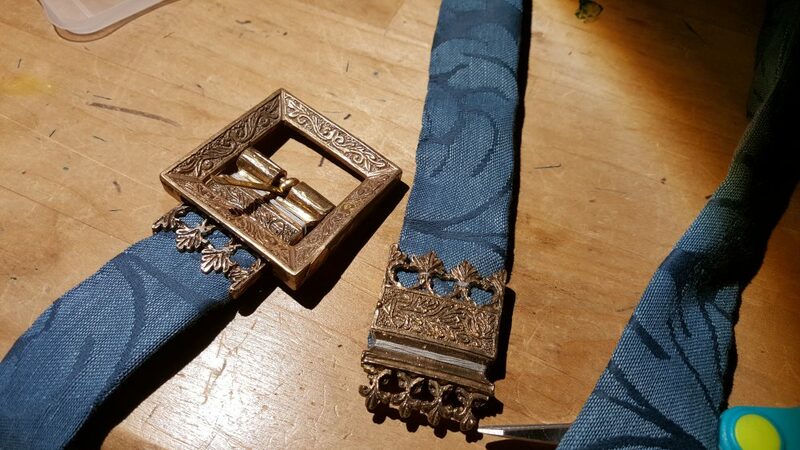 The belt went together quickly and looks lovely. 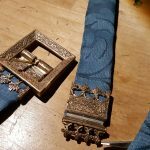 I added three eyelets in gold for the belt tongue. I removed the thingy at the top/middle of the fez. Then I draped my fez with Christmas wrapping paper (I had it on-hand and it worked splendidly) and made a pattern for my truncated hennin. I cut this out of black velvet and then seamed it all together. Since it worked so well on the dress I decided to prick stitch all the seams open. I was right and it really tightened up the hat. 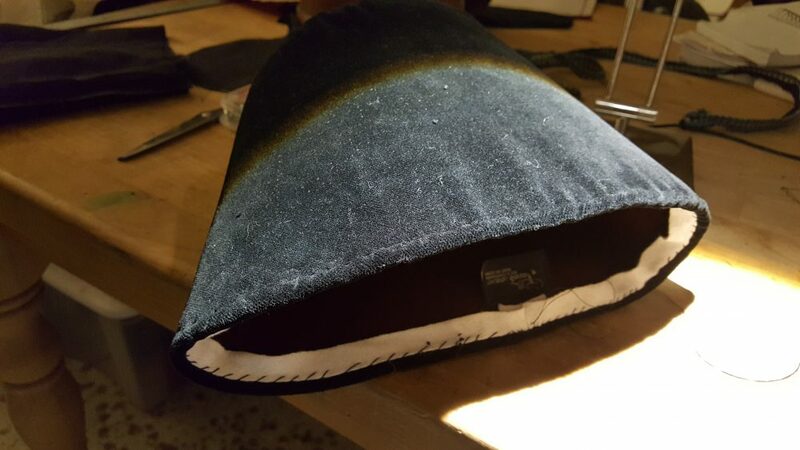 I tacked the seam allowance of the bottom edge of the black velvet hat cover inside the fez and then covered it with a strip of cotton webbing I had in my stash. Lastly I made a black velvet tube as small as I could make it and formed that into the black loop and attached it to the front of the hat. 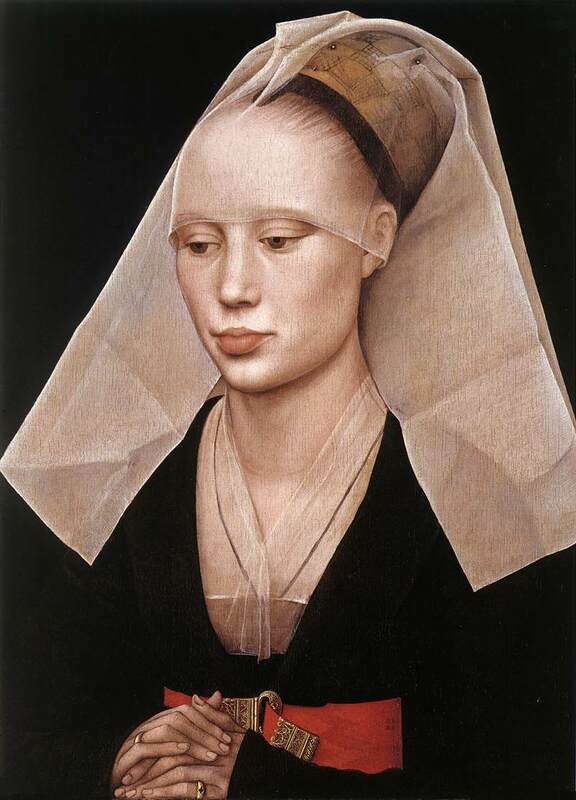 Considering how much I’d procrastinated on this I was surprised how easy the truncated hennin went together. 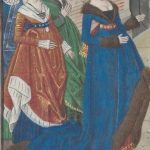 I tried the gown on over my kirtle with my new belt. For the most part it was good. The front waist seam was about 2.5-3 inches lower than I’d like it to be. After debating it for a bit I decided to remove the skirt from the front of the bodice, trim the bodice down and reattach the skirt. I traced the trimmed pieces back onto my pattern pieces I’d made for the Burgundian so I have the “real” pattern used for this project. About an hour later I had all the sewing done. Done (again) is beautiful. PPF-Burgundy starts tomorrow. I think I’m ready.